Some of the gems that made your lists of favorite tiaras were quite surprising to me – but not this one. I wholeheartedly agree with those of you that called out the simple yet significant Antique Pearl Tiara from the extensive Dutch collection as a personal favorite. ﻿This tiara’s story starts with a different diadem entirely: a pearl and diamond headpiece made for Queen Anna of the Netherlands, born Grand Duchess Anna Pavlovna of Russia, in 1840 by the Russian court jeweler Duval for the investiture of her husband, King Willem II. It’s not known exactly what became of this initial tiara; it may have been passed down to the couple’s daughter Grand Duchess Sophie of Saxe-Weimar-Eisenach alongside other items from Anna’s jewel box. Sometime around 1900 Anna’s granddaughter Queen Wilhelmina decided to have a new tiara made to replicate the old one. The new band alternates diamonds in fleur de lys shapes with single diamond uprights above a diamond garland. The band can be worn on its own, as Princess Máxima has done, or it can be worn with 7 drop pearls attached to the single diamonds. The pearls are the real standout features of this tiara. Four of them are said to have belonged to Princess Amalia of Solms-Braunfels. 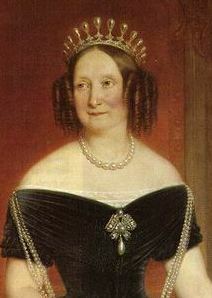 Amalia was married to Frederik Hendrik, the Prince of Orange, before there was such a thing as a “King of the Netherlands”. She lived from 1602-1675 and that means these pearls are very possibly the oldest items in the family collection (it’s also where our name – “Antique Pearl Tiara” – comes from). The largest is an extremely rare large pearl, weighing around 41 grains. Like its fellow Dutch tiara cousins, this was placed in the family jewel foundation by Queen Juliana. This makes it available to a variety of family members; Queen Beatrix, her sister Princess Margriet, and her daughter-in-law Princess Máxima have all worn it. In fact, this is the very first tiara Máxima ever wore, to Crown Prince Haakon and Crown Princess Mette-Marit’s wedding in 2001. Back then she may have been a royal fiancée, but she was still just plain Ms. Máxima Zorreguieta, a few months away from marrying a prince. She wore it without the pearls, a look I’m not terribly fond of (it’s so short! 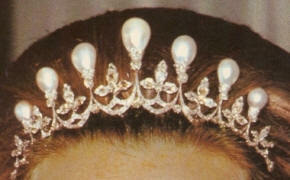 ), but in that context it was perfect - sort of a half tiara for a half princess. Where does this one rank on your list of favorites?